After a week of perfecting their soccer skills, come out and see your favorite players at Micheal A. Carroll Stadium! Who’s your favorite Indy Eleven player? Lovel Palmer or maybe even Dylan Mares? On June 10th come out for our Indy Eleven League Night and see these players on their home turf at 7:30 pm. 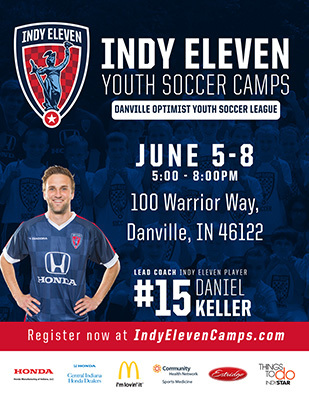 Indy Eleven League Night is a great way to kick back and enjoy time with your friends and family while supporting your favorite club, Danville Optimist Youth Soccer League. Tickets will be sold at face value at $13, so make sure you get them fast before they run out! You will see some familiar faces while you sit with the club and also experience the players up close. Come out and watch a great match with two great professional teams — Indy Eleven vs. Jacksonville Armada FC!